I’m what you call a horror game minimalist. I think the mood and atmosphere of a horror game can be completely destroyed by popular videogame conventions. Garish and invasive UI elements, shoehorned crafting mechanisms, mindless fetch and collection quests: there are a number of features we accept as an established part of the framework of a game that can be a distraction in a genre that relies on tension, pacing and environment. As an example, take a look at the original F.E.A.R. and F.E.A.R. 3. The raw simplicity of the first game let the narrative stand on its own two feet, while making the shooting segments quicker to adapt to and the horror events appeasingly consumed in small bites. F.E.A.R. 3, however, was an obnoxious display of shooting game mainstays, from multiplayer modes, to a co-op scoring system that in context and appearance was almost vulgar. In trying to be more like other games, what made F.E.A.R. special and effective all but disappeared. Thankfully, The Evil Within 2 is an improvement on itself, if not on the many established tropes it borrows from. In some ways it is actually better off for adopting some of the stalest features in the entire medium: the improved stealth system successfully adds some necessary intrigue and tension to the combat, and the open world exploration is miles more entertaining than the obnoxiously stilted play areas of the game before. There’s even a map and a well organized user interface! Both are already an almost universal, basic necessity in videogames, but better late than never, right? But the rest of it just seems so unnecessary for a horror game. Far be it from me to try and define an entire genre based on my preferences alone, but crafting and character upgrades are a mood-breaker, and add almost nothing to a horror-based experience. In some cases they might provide a level of fun and creativity that gives a game its own personality (see: Dead Rising). But the vast majority of the time, they’re filler, making little thematic sense outside of the initial premise. Why in the world would Sebastian Castellanos have a crossbow, much less the means and knowledge to improve on its original design? Ah, but to ask that is to question almost every game I’ve played in the past decade. Like many games, The Evil Within 2 is so caught up trying to chase a trend that it forgets to be its own thing. I’m sick of seeing “game design by clueless capitalist investors.” Just because something works in many games doesn’t mean it needs to be in every single one. 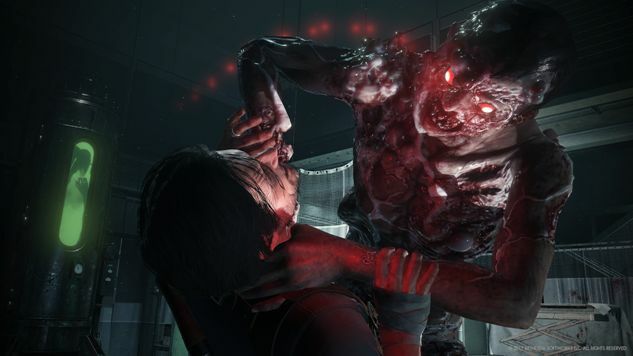 The Evil Within isn’t a story that was first written and then developed into a playable experience. A list of popular, profitable gameplay mechanics was established and then the game was written around them. The end result is sometimes enjoyable, but mostly cliche. There are so many great game-changers that this series could have modeled itself after in attempting to stake its claim on the genre. It lacks the quirkiness of Deadly Premonition or D4. It doesn’t have the dramatic paperback appeal of Alan Wake. The writers of the series need to decide what they want The Evil Within to be, and then really lean into it. Is it a stealth combat game with open world elements? If so, then the combat needs a distinctive quality, and it needs to be challenging and fun. Is it a narrative driven game? Then it needs to improve upon the writing. One thing that The Evil Within has done right so far? Improved with its second game. Let’s hope that’s one element of the formula that repeats with the inevitable third installment. The Evil Within 2 was developed by Tango Gameworks and published by Bethesda. Our review is based on the PlayStation 4 version. It is also available for PC and Xbox One.